Premieres January 24, 2015 at 1pm on WMHT TV! Test cook Dan Souza uncovers the secrets to the Best Chicken Stew. Next, equipment expert Adam Ried reviews 13 by 9-inch metal baking pans in the Equipment Corner. Then, test cook Bridget Lancaster shows host Christopher Kimball how to make the ultimate Cream Cheese Brownies. Test cook Bridget Lancaster shows host Christopher Kimball how to make the Best Almond Cake. Then tasting expert Jack Bishop challenges Chris to a tasting of supermarket orange juice. And finally, test cook Julia Collin Davison uncovers the secrets to making the ultimate British-Style Currant Scones right at home. Test cook Bryan Roof uncovers the secrets to the perfect Broiled Pork Tenderloin. Then equipment expert Adam Ried reviews wine savers in the Equipment Corner. And finally, test cook Julia Collin Davison shows host Christopher Kimball how to make the best Rice and Lentils with Crispy Onions. Test cook Dan Souza shows host Christopher Kimball how to make Mexican-Style Grilled Steak at home. Next, tasting expert Jack Bishop challenges Chris to a tasting of dark chocolate. Then, man on the street Doc Willoughby learns about tacos with chef Alex Stupak of Empellón Cocina. And finally, test cook Julia Collin Davison uncovers the secrets to the ultimate Shredded Beef Tacos. Test cook Bridget Lancaster uncovers the secrets to Rigatoni with Beef and Onion Ragu. Then, equipment expert Adam Ried reviews colanders in the Equipment Corner. Next, tasting expert Jack Bishop challenges host Christopher Kimball to a tasting of white beans. And finally, test cook Julia Collin Davison shows Chris how to make perfect Pasta with Pesto, Potatoes, and Green Beans. Test cook Julia Collin Davison shows host Christopher Kimball how to make Latin American-style Flan at home. Next, equipment expert Adam Ried reviews cookie presses in the Equipment Corner. And finally, test cook Bridget Lancaster uncovers the secrets to the ultimate Chocolate Crinkle Cookies. Host Christopher Kimball goes into the kitchen with test cook Bridget Lancaster to learn how to make Crispy-Skinned Chicken Breasts at home, and tasting expert Jack Bishop challenges Chris to a tasting of jasmine rice. And finally, test cook Julia Collin Davison shows Chris how to make the best Rice and Pasta Pilaf. Test cook Julia Collin Davison uncovers the secrets to the best homemade Cioppino. Then, tasting expert Jack Bishop challenges host Christopher Kimball to a tasting of fire-roasted tomatoes. Next, gadget guru Lisa McManus uncovers the best seltzer makers. And finally, test cook Bryan Roof shows Chris how to make Shrimp Fra Diavolo at home. Test cook Bridget Lancaster reinvents a classic, Cornish Game Hens. Then, equipment expert Adam Ried reviews French presses in the Equipment Corner. And finally, test cook Julia Collin Davison shows host Christopher Kimball how to make a perfect French Apple Tart. Test cook Bridget Lancaster uncovers the secrets to making the ultimate Lemon Pudding Cake. Next, equipment expert Adam Ried reviews stand mixers in the Equipment Corner. Then, test cook Julia Collin Davison shows host Christopher Kimball how to make Fresh Strawberry Mousse. Test cook Julia Collin Davison shows host Christopher Kimball how to make Mahogany Chicken Thighs. Next, gadget guru Lisa McManus reviews her favorite kitchen gadgets. And finally, test cook Bridget Lancaster reveals the test kitchen’s secret to perfect Stir-Fried Asparagus with Shiitake Mushrooms. Test cook Julia Collin Davison reveals the secrets to making perfect Eggplant Involtini. Next, gadget guru Lisa McManus reviews microwave pasta cookers. Then, tasting expert Jack Bishop challenges host Christopher Kimball to a tasting of prosciutto. And finally, test cook Bridget Lancaster shows Chris how to make Fusilli with Ricotta and Spinach. Test cook Julia Collin Davison shows host Christopher Kimball how to make Perfect Poached Chicken Breasts. Next, equipment expert Adam Ried reviews mandolines in the Equipment Corner, and gadget guru Lisa McManus reviews kid-friendly knives. Finally, test cook Bridget Lancaster uncovers the secrets to the freshest Carrot-Ginger Soup. Test cook Julia Collin Davison uncovers the secrets to The Best Gluten-Free Pizza. Then, test cook Dan Souza explains the science of gluten. Next, tasting expert Jack Bishop challenges host Christopher Kimball to a tasting of gluten-free spaghetti. And finally, test cook Bridget Lancaster shows Chris how to make Gluten-Free Chocolate Chip Cookies as good as the original! Host Christopher Kimball goes into the kitchen with test cook Bridget Lancaster to learn how to make Vietnamese Beef Pho at home. Next, Chris answers viewers’ questions. And finally, test cook Becky Hays uncovers the secrets to making the best Singapore Noodles. Man on the street Doc Willoughby visits Tony Maws at Craigie on Main to learn all about burgers from a pro. Then, host Christopher Kimball goes into the kitchen with test cook Bridget Lancaster to learn how to make the Best Grilled Burger at home. Then, test cook Dan Souza demonstrates why you should grind your own burger meat. Next, tasting expert Jack Bishop challenges Chris to a tasting of Swiss Cheese. And finally, test cook Dan Souza uncovers the secrets to making Thick-Cut Sweet Potato Fries. Test cook Julia Collin Davison uncovers the secrets to making the perfect Grilled Fish Tacos at home. Then, equipment expert Adam Ried reviews bench scrapers in the Equipment Corner. And finally, test cook Bryan Roof shows Chris how to make the ultimate Sesame Crusted Salmon with Lemon and Ginger. Man on the street Doc Willoughby visits Michael Psilakis at Kefi to learn all about Greek cuisine. Then, host Christopher Kimball goes into the kitchen with test cook Bridget Lancaster to learn how to make Grilled Chicken Souvlaki at home. Next, equipment expert Adam Ried reviews mixing bowls in the Equipment Corner, and gadget guru Lisa McManus reveals her favorite yogurt maker. Finally, test cook Julia Collin Davison shows Chris how to make the ultimate Tabbouleh. Test cook Dan Souza shows host Christopher Kimball how to make the best Garlic-Lime Grilled Pork Tenderloin Steaks. Next, equipment expert Adam Ried reviews his favorite grill gadgets. And finally, test cook Becky Hays reveals the secrets to perfect Quinoa Pilaf with Chipotle, Queso Fresco, and Peanuts. Test cook Bridget Lancaster uncovers the secrets to making the ultimate Grilled Bacon-Wrapped Scallops. Then, tasting expert Jack Bishop challenges host Christopher Kimball to a tasting of frozen yogurt. Next, gadget guru Lisa McManus reviews her favorite kitchen gadgets. Finally, test cook Julia Collin Davison shows Chris how to make perfect Southern Shrimp Burgers. Test cook Julia Collin Davison teaches host Christopher Kimball how to cook a traditional Portuguese Soup, Caldo Verde. Next, gadget guru Lisa McManus reviews her favorite ladles, and finally, test cook Becky Hays reveals the secrets to ultimate Spanish Garlic and Almond Soup. 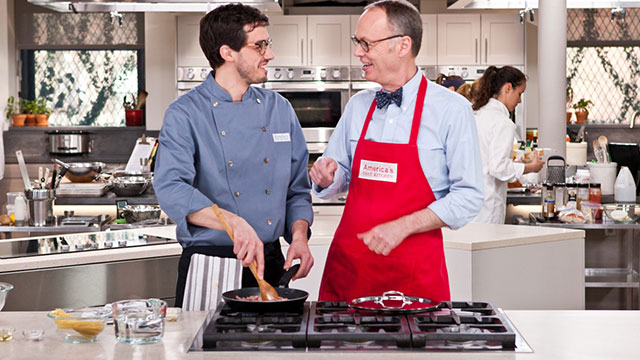 Test cook Dan Souza teaches host Christopher Kimball how to cook the best Pasta Frittata with Sausage and Hot Peppers. Next, Chris answers cooking questions in Letters to the Editor. And finally, test cook Bridget Lancaster updates a classic recipe for Cheese Soufflé. Test cook Julia Collin Davison uncovers the secrets to Easy Sandwich Bread. Next, tasting expert Jack Bishop challenges host Christopher Kimball to a tasting of artisanal cream cheese. Next, gadget guru Lisa McManus reviews her favorite kitchen gadgets. And finally, test cook Becky Hays shows Chris how to make the best Zucchini Bread. Test cook Julia Collin Davison shows host Christopher Kimball how to make the best Thai Chicken Curry with Potatoes and Peanuts right at home! Next, tasting expert Jack Bishop challenges Chris to a tasting of five-spice powder. And finally, test cook Bridget Lancaster reveals the secrets to the ultimate Chinese Braised Beef. Test cook Bridget Lancaster shows host Christopher Kimball how to make Slow-Roasted Bone-in Pork Rib Roast. Next, equipment expert Adam Ried reveals his top picks for freezer storage bags in the Equipment Corner. Then, gadget guru Lisa McManus reviews her favorite kitchen gadgets. Finally, test cook Dan Souza uncovers the secrets to making the best Roasted Butternut Squash with Browned Butter and Hazelnuts. Test cook Bridget Lancaster shows host Christopher Kimball how to make The Best Baguette at home! Then equipment expert Adam Ried uncovers the essential tools for baking baguette in the Equipment Corner. And finally, test cook Dan Souza explains the science behind carbonation.